The rock is called ALH 84001 and on August 7, 1996 an announcement was made that indicates ancient, microscopic life existed on Mars. By studying a rather un-assuming potato shaped rock, it was determined not only that it originated from Mars, but it also contained complex organic compounds, magnetite, carbonate minerals and even fossils of rod-like structure. While it seems that scientists were not looking for anything in particular when studying this rock, they seem to have stumbled on a proverbial gold mine – or have they? While the evidence to support the presumption of life seems un-deniable, the question many are asking is have all other explanations been ruled out. Since then, this small self-effacing rock has been the hotbed for debate for the past 10 years. The difficulty in choosing a side is two-fold: not once has either side denied the possibility of life on Mars, and there are limited samples to provide evidence to support any claims of life. But ultimately it seems the evidence strongly suggests that life did exist on Mars. With data from the Mars Global Surveyor and the Mars Exploration Rovers (Spirit and Opportunity), the case for water once flowing on Mars is pretty strong. The concentration of CO2 in the atmosphere is thought to have been enough to sustain liquid water about 3.7 to 3.9 billion years ago. It is also during this time that heavy bombardment of Solar System debris had ceased [R5]. With the necessary conditions available (a heat source, an atmosphere, volcanism), it is possible life could have appeared. As the planet cooled (because is small), volcanism ceased, greenhouse gasses (no longer replenished) escaped into space and the water, with further impacts, would have evaporated – lost into space [R5]. Any life that had appeared would now have dried up, locked into the crust. When a meteor impacted the crust 16 million years ago, it sent pieces of it into space (because the gravity is not as strong as Earth) - and pieces of the crust would still have features of water erosion due to lack of tectonics. As the debris traveled through space for a time, it ultimately landed in Antarctica some 13,000 years ago [R4]. This 1.9 kilogram, potato shaped rock was picked up at Alan Hills, Antarctica on December 27, 1984 [R2][R4]. It sat on a shelf for about 10 years before being examined, and that is when all the excitement hit the fan. It seems the evidence is surprisingly overwhelming that life did exist on Mars, but since this announcement was made alternate explanations have been offered to explain each of these attestations. By using Stereo Light Microscopy (SLM), High-Resolution Transmission Electron Microscopy (HRTEM) and Energy Dispersive Spectroscopy (EDS), McKay’s team concluded that fractures within ALH 84001 contain carbonate material – specifically Iron, Calcium, Sulfur, Magnesium and Phosphorus [R6]. It is suggested that these deposits were formed when water poured through the rock. This alone is not indicative of life, but according to the McKay team this first piece of evidence is the base by which the other three are supported [R2]. The problem with this first piece of evidence is that while the presence of these minerals does imply that water did flow through, this same material can also form given the right conditions. For example, this same material can form without any biologic influence under high temperatures of several hundred degrees Fahrenheit [R4]. Water is not necessary. Polycyclic Aromatic Hydrocarbons – or PAHs – are a complex form of organic material that is believed to form by biological breakdown like decomposing plant life [R4]; this material is believed to be formed by bacterial decomposition. The organic material is made up of phenanthrene, pyrene, chrysene, benzopyrene and anthanthracene [R6]. In order to rule out any contamination, PAHs levels were compared between ALH 84001 and the area surrounding Alan Hills. It was concluded by McKay’s team that the PAHs within ALH 84001 were not cross-contaminated with the Alan Hills site. While McKay’s team confirmed the levels of PAHs between Alan Hills and ALH 84001 suggest these formed on Mars, there is evidence that contamination could still be a factor. A second meteorite from Mars, one much younger than ALH 84001 also contains the same levels of PAHs. This demonstrates the likely hood of contamination by the Antarctic ice sheets [R4]. In addition, the formation of PAHs is not required to form by biologic activity and may form by other means [R5]. For example, PAHs can form in interstellar space as well as smokestacks and automobile engines [R4][R5]. While the presence of Magnetite can be formed by way of organic or inorganic processes, it has been established by McKay et al that the Magnetite present in ALH 84001 is similar to Earth formed Magnetite. It is further established that the Magnetite crystals were formed by biological processes (bacterial decomposition) based on the Magnetite’s hexa-octahedral crystal shape – a process that is not found by formation through inorganic methods [R7]. While the Magnetite evidence seems compelling, another group examining the Magnetite crystals discovered defects and fracture not consistent with the organic formation of the crystals – instead indicate formation by inorganic methods under high temperatures [R4]. In addition, the presence of Magnetite and Greigite (which is still unconfirmed [R16]) strongly suggest the appearance of biological formation is simulated by temperature changes [R5]. Perhaps the most dramatic piece of evidence is the presence of microfossils of what looks like nano-bacteria. 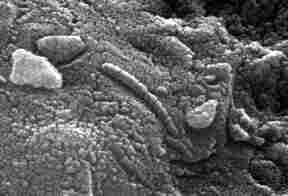 In fact, the microfossils found look exactly like the nano-bacteria found on Earth (although much smaller) [R2]. Further, the age of the rock implies that Mars was wetter and warmer in the past so that the formation of these nano-bacteria is possible [R2][R6]. It is these micro-fossils that support the evidence for PAHs [R13]. A scanning electron microscope was used to capture the image of the micro-fossil in question, but it is argued that the process of scanning can produce “fractures” that can look like these microfossils [R4]. While there is no mention of any possible contamination by terrestrial sources, it is suggested that these microfossils can be mineral grains and therefore non-biological [R4]. An example of this would be fossilized mineral grains found in Columbia River Basalts [R10]. In addition, the nano-bacteria have a size limitation of 150nm for replication [R16] and the samples in ALH 84001 are smaller. Aware of the debate with the ALH 84001 results, Gibson and McKay et al released a paper with additional supporting data. It is acknowledged that contamination and misinterpretation is possible; however, data discovered within two additional Mars meteorites – Nakhla and Shegotty – as well as confirmation from a second examining group support the initial claims. The team acknowledges the process of carbonate material can form under high temperature. It is asserted that early Mars was warmer and wetter providing the right conditions for the carbon material to form. In addition, impacts on Mars would also provide the right conditions for the carbonate materials to form as well. The McKay team reports that PAHs are not a diagnostic for life, but PAHs present with carbonate material supports life. Contamination has been ruled out by other teams examining ALH 84001. In addition, PAHs have also been detected in the meteorite Nakhla. Additional teams studying ALH 84001 have also ruled out any terrestrial contamination as well as any formation by result of high temperature and shock. Reexamination demonstrates three types of Magnetite crystals are present suggestion formation through abiotic process in a low temperature environment – ruling out fracturing caused by high temperatures, or temperature fluctuations suggested by the presence of Greigite. While it is accepted that the micro-fossils can be fossilized minerals, nano-bacteria can also mineralize. Terrestrial analogs have been detected in the blood-stream of mammals which rules out the possibility of artifacts caused by electron microscope scanning. The nano-fossils are most likely smaller parts of larger bacteria explaining the small size. The McKay team is careful to state that the evidence is circumstantial and must be examined in context. Each piece of evidence relies on each other and must be looked at as a whole. Discovered inside cracks indicated formation through water. Can form through non-biological process in high temperatures. Biological process can still form carbonate material in high temperatures. Formed by biological process – breakdown of organic material. Can form in space, high temperatures and possible contamination. No claim to direct PAHs formation and biological process. Contamination ruled out by other studies. PAHs found in another meteorite from Mars – in conjunction with carbon material suggests biological process. Crystal shapes equal to material found on Earth – through biological process. Crystals examined were fractured, formed likely by high temperatures. Three types of crystal shapes, all by biological process. No evidence of formation by high temperature. Scanning electron microscope reveals bacteria looking micro-fossils. Could be fractures caused by the scanning, could also be mineral grains. They are too small to replicate. Nano-bacteria can mineralize. Same shaped nano-bacteria found in mammalian blood rules out artifacts. Smaller nano-bacteria part of larger bacteria. The process of examination performed by the McKay team is a testament to the Scientific Method. Their initial results were carefully laid out while providing data for any counterpoints, such as contamination (being one of the main issues). They were careful to announce any “hard facts” and stated their evidence was circumstantial. The arguments against the data were presented; the processes defining the arguments were reasonable, but explainable by rebuttal. In addition, the data was confirmed by a separate examining group – and this was even indicated by one of the contender’s papers [R4]. The data presented and the arguments resulting are enough to demonstrate that life could have existed on Mars. The fact that two additional meteorites were found to support the results of ALH 84001 corroborate this. The debate will no doubt continue, and rightly so. It was Carl Sagan who said “extraordinary claims require extraordinary evidence.” Until Astronomers find a smoking gun to prove life – which is an extraordinary claim outside the realm of Earth – the data will most likely be interpreted based on point of view or circumstance. [R1] Becker, Luann; Popp, Brian; Rust, Terri and Jeffrey Bada. “The Origin of Organic Matter in the Martian Meteorite ALH84001.” EPSL. Elsevier. 14 January 1999. [R2] Gibson, Everett K. and David S. McKay. “The Case for Relic Life on Mars.” Scientific American, Volume 277, Issue 6, page 58. December 1997. [R3] Gibson, E.K. et al. “Life on Mars: Evaluation of the Evidence within Martian Meteorites ALH84001, Nakhla, and Shergotty.” Precambrian Research. Elvevier. 12 July 1999. [R4] Knoll, Andrew. “A Martian Chronicle.” The Sciences. July/August 1998. [R5] Lunine, Jonathan. Astrobiology. A Multidisciplinary Approach. Pearson Addison Wesley, San Francisco. 2005. [R6] McKay, David S. et al. “Search for Past Life on Mars: Possible Relic Biogenic Activity in Martian Meteorite ALH84001.” Science, volume 273. 16 August 1996. [R7] Thomas-Keprta, Kathie et al. “Truncated Hexa-octahedral Magnetite Crystals in ALH84001: Presumptive Biosignatures.” PNAS, volume 98, number 5. 27 February 2001.